1. To Evaluate SA-1 Papers In Mandal Level it Must be Constitute A Committee For Every 10 Schools Which Contains 7 Members Of Subject Teachers I.E. 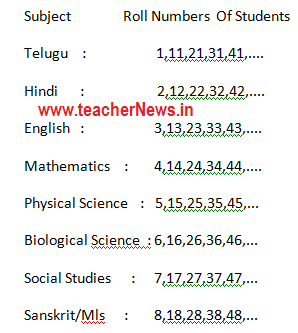 Telugu, Hindi, English, Mathematics, Physical Sciences, Biological Sciences, Social Studies. 2. One Gr-II Headmaster Will Be Act As Moderate Committee Member For Every Single Committee (Every 10 Schools). Note : MEOs constitute these committees within 05-10-2016 and submit the list to concern Dy.E.Os as early as possible. 3. 5% Of External Evaluation Must Be Processed Under Gr-Ii Headmaster. 4. There Will Be One Spot Evaluation Center / 5% External Evaluation For Every 10 Schools. 6. Total Response Is In The Hands Of Mandal Educational Officers. 7. Answer Scripts Must Be Collected From Every Single School By The Cluster Resource Person(C.R.P) And These Persons Will Submit Them In MRCs. 8. Last Date For Submitting Answer Scripts By CRPs Is 10-10-2016. 9. D.C.E.B (District Common Examinations Board) Members Will Be Act As Flying Squads For 5% External Evaluation. 10. Online Submission of SA -1 Marks: If Any Delay in Online Uploading Concern D.C.E.B Members Are Responsible.